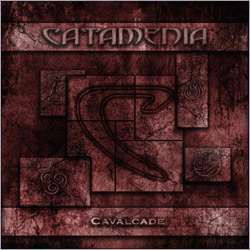 Starting in 1995 as a classic black metal band, Catamenia from Finland have gradually become more melodic over the years. This stays true also for their already ninth album Cavalcade. Despite its title, the record doesn’t contain any dreary carnival sounds, but rather appealing and varied metal music. The pace is no longer as fast as during the band’s early days, and even the vocals have become clearer, coming across as a mix between James Hetfield and Amorphis’ Tomi Joutsen. However there are still traces left over from the past, whenever truly ferocious outbursts shake the listener awake. You won’t find a pure black metal track on Cavalcade, because every single song is brimming with ideas. Elements of classic heavy metal and melodic power metal surface here and there, fitting excellently the harmonic vocal lines. Only The Vulture’s Feast seems a little apart by being closer to mid-tempo Metallica, but still having some attraction. The frequent temp changes, the wonderful vocal harmonies and the strong choruses help making Cavalcade the highlight of Catamenia’s band history. The album ends with Angry Again, a groovy rock song somehow not in line with the remaining material, but an excellent conclusion to the CD. Early fans might accuse Catamenia of being too soft, yet it is undeniable that the band has incredibly evolved since their inception fifteen years ago, refusing to constantly repeat themselves. Cavalcade is an excellent album full of suspense that doesn’t reveal from the onset where it’s heading to, thus being certain of keeping their audience’s attention.